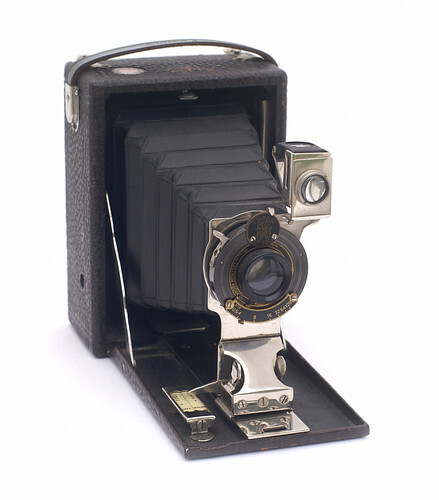 Eastman Kodak's Film Premo No.1 Folding plate camera used 3 1/4 × 4 1/4 sheet film (quarter-plate format). It was equipped with a Rochester Optical Co. Planatograph lens and Ball Bearing Shutter. The camera was patented in 1903 and produced in 1906. It seems to have been the budget variant of the Kodak Pocket Premo C which reminded more of the quality of Rochester Optical's original Premo cameras (wooden front door). George Eastman's idea to popularize photography may have inspired Kodak's camera engineers to make this cheaper variant after Kodak had bought Rochester Optical in 1903.